It all began when our son, then aged 6, attended a friend's birthday party that included a dark and scary 'Ghost House' for the children to explore. The clever parents and granny had closed off a couple of rooms in their house, made them very dark and decorated them with very scary bits and bobs. 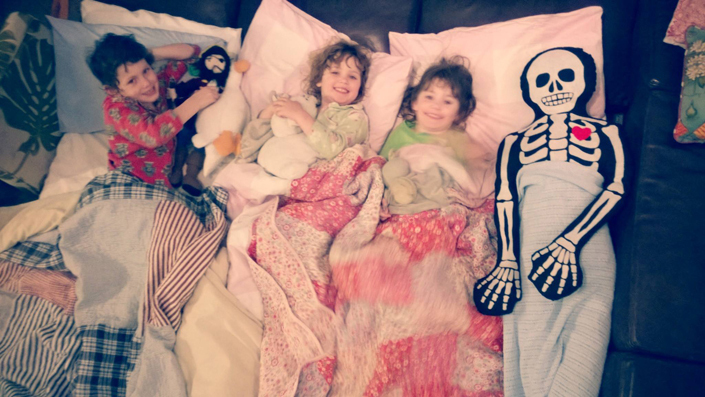 In the bedroom they created a scary person sleeping in the bed by stuffing some kids clothing and adding a hat. 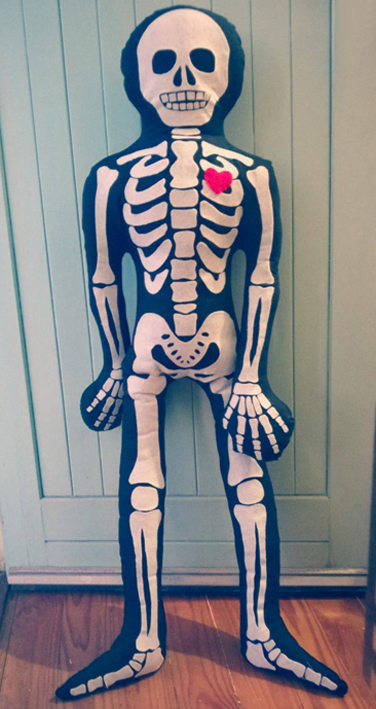 For months after the party my son begged me to please make him a life sized skeleton pillow that he could put in his bed to scare his friends. I eventually agreed. I'd make the skeleton pillow. I started by pasting together some news print paper and drawing my son's outline. 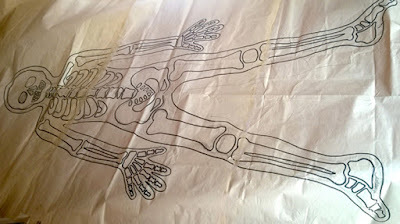 (he wanted it life size after all) It took me a long time to figure out just how I was going to go about it. 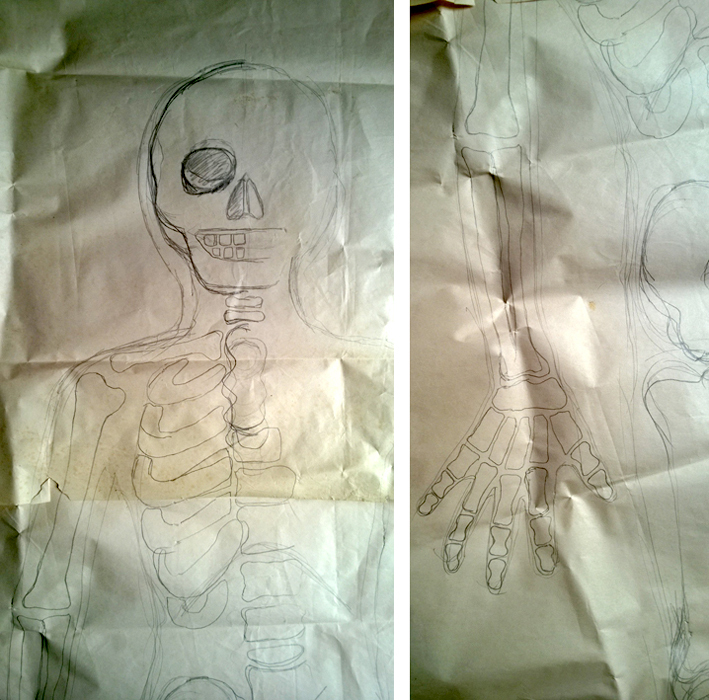 I started drawing the skull and bones onto the paper, changing and simplifying the design as I went along. 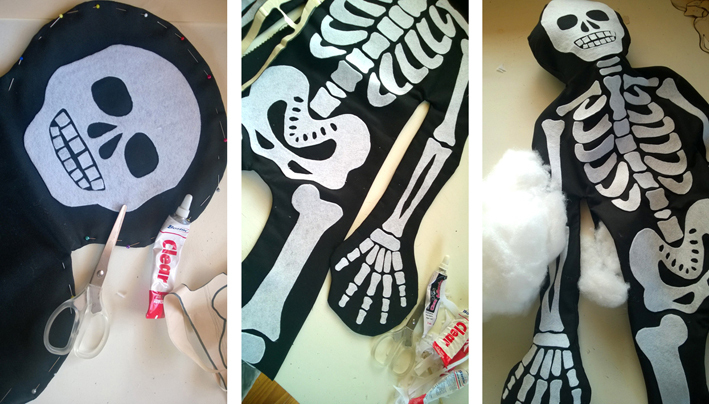 I decided to make the basic pillow out of a sturdy black cotton fabric, and then to cut the skeleton out of white felt which I glued on. 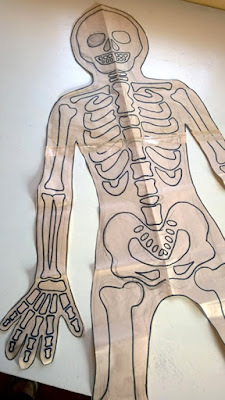 (I probably should have sewn these on, but it really was taking a lot longer to make than I thought it would.) I managed to finish it in time for his 7th birthday. 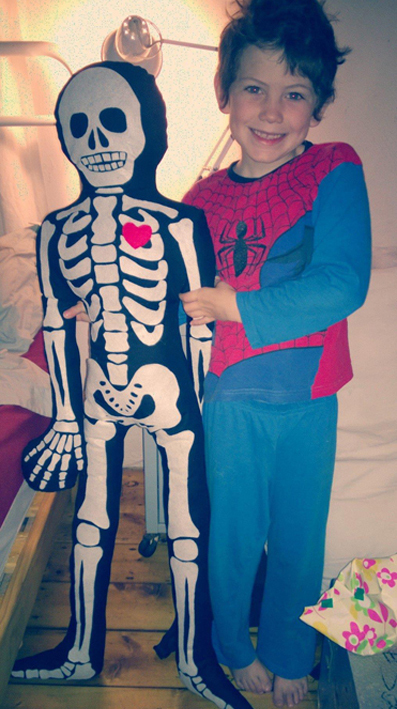 He was very excited and happy to finally receive his skeleton friend. Mr Skellie Bones has been a member of our family for a couple of years now. He is the 'other brother' to our 3 children. He enjoys going on outings, building Lego, and playing dress up. The other day he even won his first medal. Apparently he was awarded this medal for being 'Totally AWESOME!' He's a well loved skeleton. 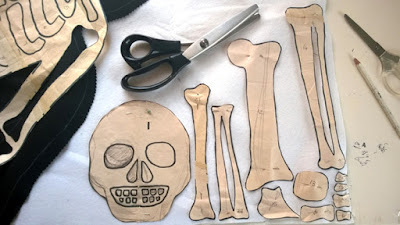 Here is the making of Mr Skellie Bones, in pictures. 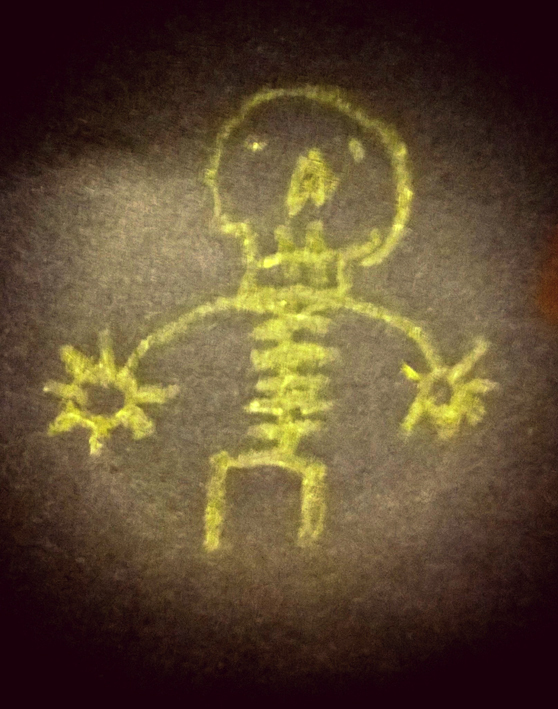 My son's drawing of a skeleton. 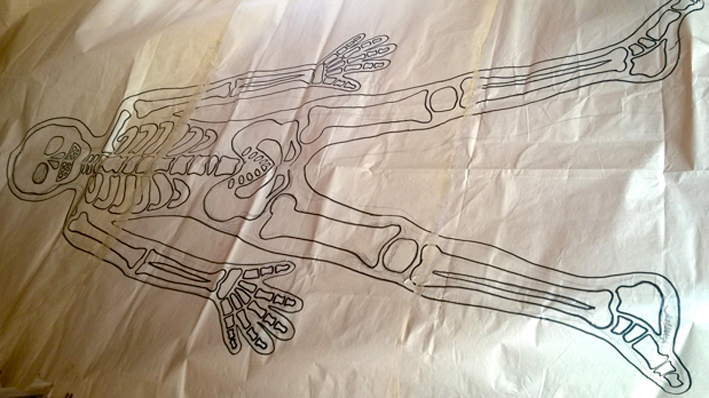 Planning and simplifying the skeleton design. Cutting the skull, teeth and bones out of white felt. Each piece was numbered so that I knew where it had to go. This took a lot of time, concentration and a huge amount of patience. Final construction. Gluing, sewing and stuffing. A very happy boy on his 7th birthday. The kids and Skellie having a "sleepover".